NOX VORAGO Join VADER And DECAPITATED On “Crushing The North Tour 2017”! 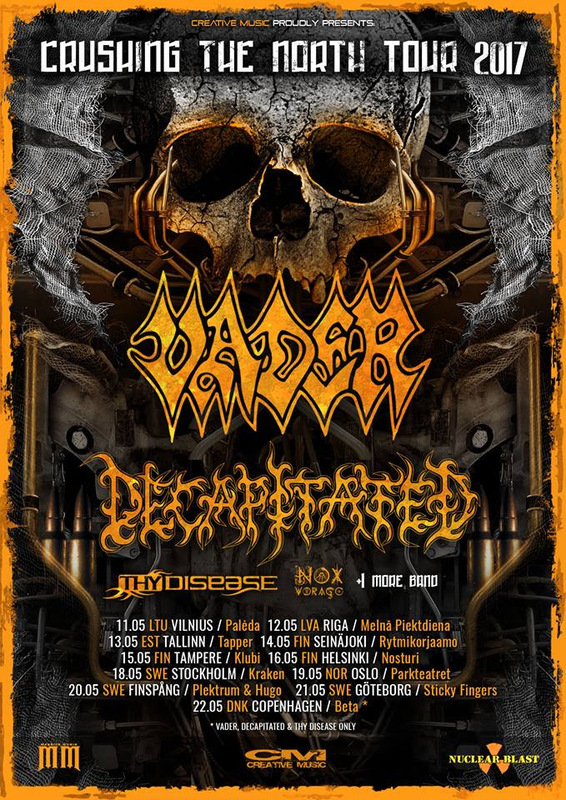 Swedish death metal unit NOX VORAGO have announced they will be joining Vader and Decapitated on the Crushing the North tour 2017. Get all the dates and details below. Gothenburg’s atmospheric Death/Black Metallers NOX VORAGO are confirmed, as support act, for the Polish death metal titans VADER and DECAPITATED on their “Crushing The North Tour 2017”, kicking off on May 11 in Vilnius. The tour will see on stage also THY DISEASE. See the tour trek below. NOX VORAGO released their new full-length album “Al Chem” on February 26th. The outstanding album cover artwork was created by Uduun Art. All the seven tracks, in their own way, represent some part of the inspirational dark philosophy and mystic phenomena that continues to challenge mankinds’ perception of reality. “Al Chem” was recorded at Top Floor Studios under the very talented Jakob Herrmann. It was mixed by the well known Roberto Laghi and mastered at Bohus Sound Recording by the legend Dragan Tanaskovic. Formed in 2006, Gothenburg’s atmospheric Death/Black Metallers NOX VORAGO‘s goal has always been, and always will be to create something inspired by the entire width of the metal scene, thus incorporating the elements they like into their music and creating a well-written chaos without confines.